Where to begin. I have known Lauren since before I could even remember not knowing Lauren. I tried to remember my first memory of us together and the best that I could come up with was when I was 6 or 7 and Lauren and I had found a single baby bird in a nest. Being the sweet, loving, compassionate girls we were, we decided we should take this baby bird out of it’s nest and become it’s “real” mothers. Needless to say, we ended up killing the poor thing. Terrible story, but that was where it started. We were always playing outside while our mom’s hung out inside, chatting and catching up on life. It only made sense that Lauren would find a man as outdoorsy as her – a man who she can share her love of horses with, a home with, and a future life with. I can’t even begin to say how much I love seeing Lauren so happy with Dustin. I love the way that they kid with each other (and how Lauren tries to get Dustin to take off his hat, even though it PAINS him to do so, but he does it anyway because he loves her). Being their wedding photographers means more than words can describe! November can not come soon enough! 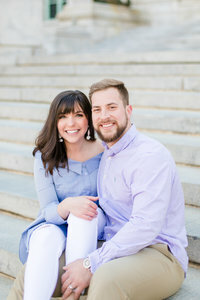 Check out their beautiful Southern Maryland engagement session! To view more engagement session, browse the links below!